OMG Posters! » Archive "Used" (Commemorative Edition) Art Print by Jermaine Rogers - OMG Posters! Originally released in 2004, collectors will get a new shot at Jermaine Rogers’ “Used” art print to commemorate the 20th anniversary of ‘Nevermind’. It’s a 16″ x 24″ screenprint, has an edition of 100, and will cost $50. There will also be a foil variant with an edition of 20 for $100. Both go up Friday, September 30th at 3pm Eastern Time. Visit JermaineRogers.com. In other Jermaine news, his 8″ “Aleppin Sane” vinyl figure is available at a number of toy stores. Check out our friends at myplasticheart and Rotofugi. 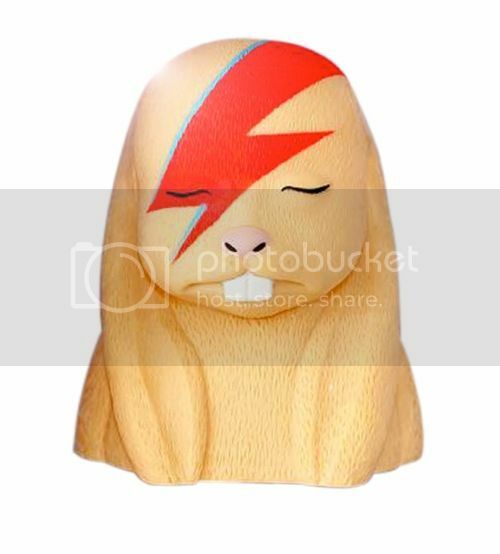 Go to designer toy sites and watch everyone completely miss the Bowie reference to the Aleppin Sane piece. That said, the original illo (used for a Foo Fighters poster) looks a lot better than the vinyl sculpt. 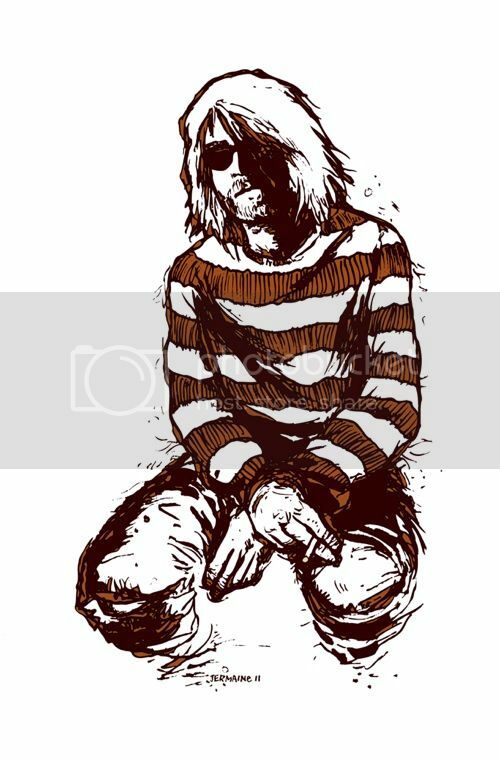 A $100 foil variant of a Kurt (RIP) sketch that Jermaine knocked out in about 15 minutes. I’ll take 5!! Is this really getting hated on or are people just trying to keep this from selling out quickly? I have a few screen prints but I’m not a collector. I bought my first print this year and only buy what I want to frame and display in my home. I plan on buying this and hanging it in my hallway. I won’t buy the variant even if I have the option, not because I think it’s overpriced, but because I can’t imagine the laser foil paper looking proper framed on a wall… Feel free to correct me if I’m way off base. That bunny looks amazing. Hoping they have it at the designer toy store inside the Cosmo so I can see it in person before buying. Commemorate the 20th anniversary? Looks like a Money grab to me. exactly my sentiments. making extra dough off a 2nd edition off of the image of a dead guy. commemorating the anniversary by putting money in Jermaine’s pocket. not cool at all. Yep totally classless. He already made a reg verision and a smaller red version and now this. STOP LYING TO YOUR FANS BY SAYING SOMETHING IS LIMITED AND THEN CONSTANTLY MAKING MORE EDITIONS. I don’t care one way or the other about the print, but I have to say his bunnies are creepy as fck. There’s just something about them I can’t stand. This question may be a little off-topic For starters, WHAT IS A CERTIFICATE OF AUTHENTICITY?